Supercor Puerto Cruz for convenience shopping an outlet of the oldest Spanish department store Corte Ingles was expected eagerly in the oldest Tenerife resort late in 2008. This first Supercor behind the old bus station was closed again fast and moved to a much better spot. Now, it's at Plaza del Charco in the hub of town by its little port and near a huge free parking plot. 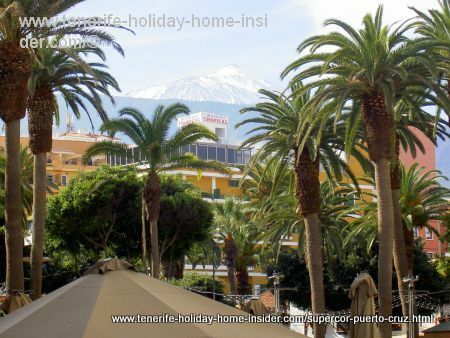 Plaza del Charco and Teide with snow seen from outside the Supercor. Click the photo for detailed information about this part of town. It's much more convenient for many locals and for people in the Tenerife self contained holiday apartments. There are many almost by the shop's doorsteps. 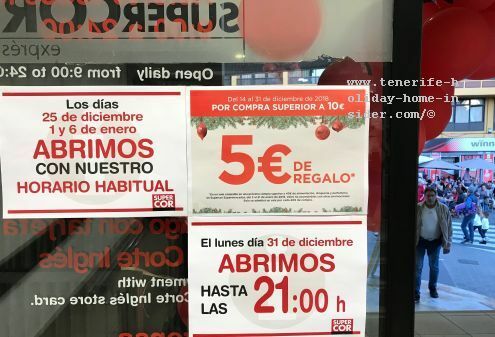 It also means you could travel to El Puerto while on holidays and could quickly buy something at its Supercor store to take home in your rented car, even on a Sunday. Tenerife Supercors open on three top public holidays until 2a.m. Only a few small Tenerife supermarkets, such as Supermercado Ecosol in La Longuera 21 are open on those prime public holidays but can't compete with the amount of 9000 products that are offered at the Corte Ingles Convenience store Supercor. The new Supercor doesn't seem to stand behind other big supermarkets for its size and variety of goods, on first sight. However, its longuer opening times make it a bit more expensive. What is different with Supercor Puerto Cruz shopping? Another is not far from the North Airport in La Laguna. From Supercor Puerto Cruz back to shopping in Tenerife which includes Santa Cruz capital.